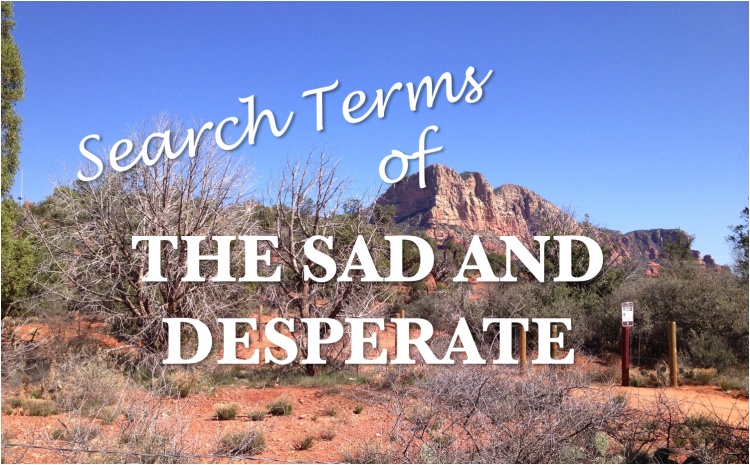 Usually, in my installments of Search Terms of the Sad and Desperate I offer advice to visitors whose search terms hit my blog. But I’m not sure the originator of today’s topic, “Gym class was never like this” is seeking advice. I think he or she is just making a statement to the world. But I’m intrigued. Is this someone who loved gym class and wishes that all life was like gym class? Or is this someone who huddled in a corner of the gym hoping no one would notice? In my experience, there is no in-between. I’m picturing someone in a cube at the office, feeling either hateful or joyful, making a comparison to a past in the gym. …we didn’t get to eat during it. …it made us sweat while right now I am basking in a frigid blast from the AC. …I never get picked last here. …at work we don’t have to swim and then go directly to a meeting. …I can sit in the same chair all day if I want to. …my boss is not a sadist. …we don’t get to “accidentally” hit each other with field hockey sticks here. …humiliation of others was tolerated, and sometimes openly encouraged. …I was always picked first. …those who violated the rules got a foul or better yet, got kicked out of class. …now, I have to sit in the same chair all day. …the gym teacher was not a sadist. How about you? Did you hate gym class? Love it? How would you finish this sentence? I am dying to know. This entry was posted in Little Leaguer, Parenting, Surly Teen and tagged advice, at the office, blogging, funny search terms, gym class, humor by Sarah Day. Bookmark the permalink. I love that your job is not like gym class! Mine isn’t either.. mostly. I’m not sure if I’m talking about the writing, photography or parenting. I guess it is like gym class because it requires wardrobe changes. It’s not like gym class because I’m not getting a C-! Ha, ha! That’s about how I feel about it. Gym was not my strong point. This is a comment sure to inspire the reflection, “Dang, why didn’t I think of that?” At least among that half of the population who spent most of their creative energy trying to invent reasons they couldn’t participate in gym class.